The springs in your garage door system take the weight and counterbalance the entire door, so when they break, the ramifications are obvious. It may be one of the more common problems but it is also one of the most dangerous as you could be struck by a flailing spring or crushed by a falling door. For this reason, knowing what to do in this situation is of prime importance. We’ll also explain how to avoid it in the first place. Although garage door springs do all the heavy lifting, they are specifically manufactured to withstand the type of constant compression and release encountered during normal use. However, they’re not indestructible and there are a number of reasons why they fail. The first occurs simply from prolonged use, in other words, they wear out. Secondly, rust can also be a contributing factor to them snapping. This can be a particular problem for springs that are not galvanized or do not have a protective coating. 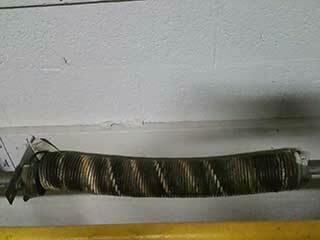 Routine maintenance and lubrication are the key to significantly increasing the life of your garage door springs. A well-lubed spring will run more quietly and smoothly while regular inspection highlights potential problems before they get to the point of no return. Both of these preventative measures will effectively reduce the risks of inconvenient and expensive downtime or worse. Routine balance tests are equally as important too, as they tell us if the spring is correctly tensioned or requires adjustment, yet another key factor in door spring longevity. If you’re faced with one or more broken springs, there really is only one course of action - get professional help. Removing and replacing these type of components is dangerous due to the tension they are under and requires skill and experience. Our professional technicians are equipped with the knowhow and the right tools for the job, whether it’s a torsion or extension spring that needs replacement or repair. If this happens to you, we provide an emergency call out service, so don’t hesitate to make us your first call!